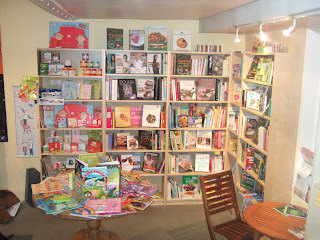 Mostly Books bookshop in Abingdon : Sustainability and shelving...and sunshine! Nothing can fully prepare you for the shock of day-to-day retailing. It is the most intense, interrupt-drive, unpredictable, no-two-days-the-same bag of craziness. And of course we love it. There is a downside, unfortunately, and that often we are often completely knackered! And with Nicki now (officially) off on maternity, the blog has suffered for the last couple of weeks– apologies for that. Here’s a bit of an update on what’s been going on in the shop – we haven’t done a tour around for a while, so here goes. This past week our Wednesday bookgroup met – here’s a picture (left) of the aftermath of our intense discussion on When I Grow Up by Bernice Rubens. We’d selected this as our ‘memoir’ for this half of the year, and I was a bit worried that there wouldn’t be the same kind of themes to discuss that you find in a fiction book – but I needn’t have worried. We had an excellent discussion (I think it helped that Bernice was an author) and it has inspired some of the group to read her novels, which is very heartening. After her death in 2004, I feel that there is a danger that some of her novels will languish and go out of print (the dreaded OOP on the system). 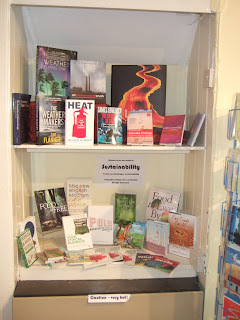 We also launched our new sustainability section last week – here’s a shot of it in the alcove. There is a real groundswell of activity in Abingdon at the moment, with a recently launched carbon-cutters group, and various environmental groups meeting in the Guildhall last Saturday as part of a carbon saver's action day. From previous activities (and posts) I have a passion for sustainability, and our sustainability section is something I’ve wanted to do (properly) since opening the shop. Coincidentally on Thursday I went to the launch of Chris Goodall’s book How to Live a Low-Carbon Life at Blackwells (cue sounds of angels singing in background, much genuflecting, etc.) in Oxford. It was good to meet both him, and an author called Mark Lynas (anyone reading the Sunday Times magazine this weekend should have been scared witless by the conclusions of his latest book Six Degrees) and we hope to have an event with both of them soon. (I was also hoping to go on a spying mission whilst in Blackwells, but unfortunately most of the bookshop was off-limits. I consoled myself by going into Borders for an hour of undercover activity. Cue schoolboy sniggering and feeling faintly guilty as I questioned one of their staff at length about where all the environmental books were. Hee hee). 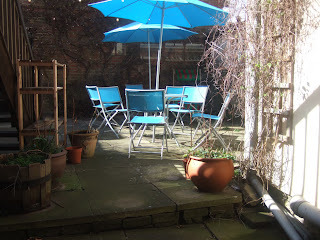 On Thursday it got so warm out in the garden, I stripped down and cleaned all the tables, and announced that the courtyard garden was open. 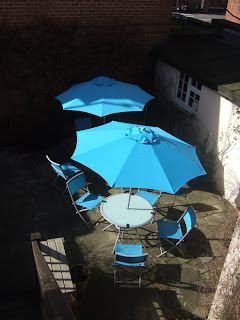 But we had no takers until a slightly chilly Saturday afternoon, with a few hardy souls venturing out to have tea and cake in the back. We also done a bit more 'remodelling' (as the Americans say) in the shop – here’s some piccies. Can you spot the big change? 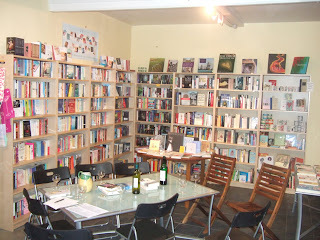 To round off a busy week, we had the first of what we hope will be regular courses for authors and writers in the shop (on Sunday). We hadn't blogged about it ahead of time, as we were a bit nervous about how it would go, but we got very good feedback from the authors that attended, and this has gives us a lot of confidence to do more courses in the future. You can learn more here. 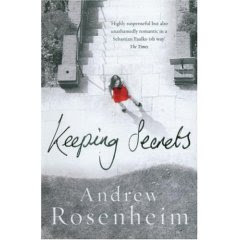 This Wednesday (March 14th) we have Andrew Rosenheim appearing in the shop at our next author event. He will be reading from his latest book “Keeping Secrets”, answering questions and signing copies of his book. I’m two-thirds of the way through Keeping Secrets, and enjoying it. He has been compared to both Kate Atkinson and Sebastian Faulks, which is very esteemed literary company to be in (and from my POV, two authors he can definitely stand comparison with), and we are looking forward to another cracking literary evening here in the shop. Yep sounds like you'll be needing it. You have been very busy, but glad you are still blogging. Glad to see the environment section. I'm particularly interested, from a campaigning and writing point of view in CLimate Change and can recognise most of the books you have from the picture. Can I suggest a couple more? Firstly Helen Caldicott's excellent book on Nuclear Power (why it isn't he solution to climate change) and Mark Lynas's new book "Six Degrees" are worth adding. I see that you have Monbiot's fantastic book "Heat" - a must read for everyone and Flannery's brilliant book. I quite enjoyed Fred Pearce's new book "The Last Generation" (though he pushes the doom and gloom a little too far at times I think) and I also found the Rough Guide to Climate Change very useful for facts & figures. Now I have overheated with all that typing and need to go and lie down. Thanks for the suggestions - will look at them all. Someone sent me this link after the documentary last week on Channel 4 "The Great Global Warming Swindle. 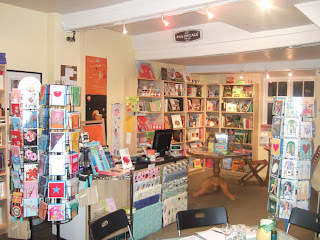 Great to catch up on all the Mostly Books news and the shop looks fantastic Mark. I also meant to say I completely agree about Bernice Rubens. I met her at a Reader's Day and was lucky enough to be in a small group discussing Nine Lives with her. Sadly she died two months later (I don't think it was my fault)but I emerged with a real love of her books. Asking which of her own books she was most proud of she said Brothers without a moment's hesitation.